In these uncertain times, we can still count on one thing – there will always be a really expensive bottle of whiskey out there that you can read about but most likely never actually taste… unless, of course, you are really rich, or really lucky, or perhaps both. You can say the same thing for cognac or tequila or vodka, but most likely it’s going to be a single malt scotch aged for over a quarter of a century that’s going to be that unicorn flying over a gilded rainbow, far out of reach of the hands of mortal man. Still, it’s fun to read about, so we’ve put together a list of some of the rarest, most expensive spirits available right now. Dare to dream. Jose Cuervo is not generally known as being really expensive tequila, but this limited edition release (25 bottles) certainly is. It pays homage to the Rolling Stones’ 1972 Tequila Sunrise tour of North America, with a bottle emblazoned with the Stones’ tongue symbol in 14-karat gold that’s packed in a guitar case. The liquid itself is blended with 100-year-old tequila from the Cuervo private cellar, and the whole batch was finished in Spanish sherry casks for a year. This tequila is truly exceptional, tasting almost more like a cognac. The Macallan is no stranger to high-end bottles, having released other expensive expressions over the years. This newest 40-year-old expression is limited to just 500 bottles worldwide. It came to life when master whisky maker Bob Dalgarno decided to let a 30-year-old batch rest for another decade just to see what would happen. The result is a lightly peated, thoroughly sherry-infused whisky that obviously made Dalgarno very happy. Bowmore claims to be Islay’s oldest distillery, so it makes sense it would want to release a super-aged whisky. The 1961 expression is part of the six-part Bowmore 50 Year Old Collection Series. When this scotch is gone, it’s really gone for good. The 1961 expression was distilled in that year, then put into two ex-bourbon hogshead casks for half a century. After so long, only 200 bottles worth of whisky were left. It’s said to have hints of honey and black truffle that intermingle with the smoke from the peat, but judge for yourself, in the unlikely event that you actually get to taste this. Knappogue is certainly not as popular an Irish whiskey as Jameson or Bushmills, but that may soon change. The brand has an excellent core group of expressions that are sourced from an unnamed distillery, but the 1951 is truly something special. The whiskey was distilled in 1951 and aged for 36 years in Oloroso sherry casks before being bottled. The result is truly unique, with an almost rum-like quality to the whiskey. Fans of extra-aged single malt scotch will enjoy this release as well. A few years ago, Teeling opened the first working distillery to operate within the Dublin city limits in over a century. In the meantime, they’ve been sourcing really excellent Irish whiskey, and this is the oldest release to date. It was distilled in 1991 and double matured in ex-bourbon and Sauterne wine casks, and released in a batch of only 1,000 bottles. There’s just a touch of smoke in the whiskey, as a very small portion of peated malt was used in its production. Editor’s Note: We actually got ahold of a sample of this whiskey. Check out the full review. With this Ledaig expression, we’re getting into more affordable territory, although it’s still a chunk of change. This 19-year-old limited edition was created using some of the first spirit distilled at the Tobermory distillery on the Isle of Mull. It’s smoky, but not overbearingly so, with nice hints of dried fruit and salty seaweed on the palate – a nice dram for a rainy day celebration. In 2012, this bottle of GlenDronach single malt scotch was signed by Donald Trump to commemorate the opening of his Trump International Golf Links in Aberdeenshire, Scotland. The bottle was part of a limited run of 504, but was the only one signed by now President The Donald. It just sold at auction for 6,000 pounds (a little over $7,000) to a Canadian purchaser. Yes, a Canadian. The whisky is rumored to be bright orange with a touch of narcissistic treacle on the nose, and a nice sherry, oak, and racist finish on the palate. The Macallan Fine & Rare collection is sort of a historical liquid snapshot of the distillery’s history, with vintage bottles dating back to 1926. 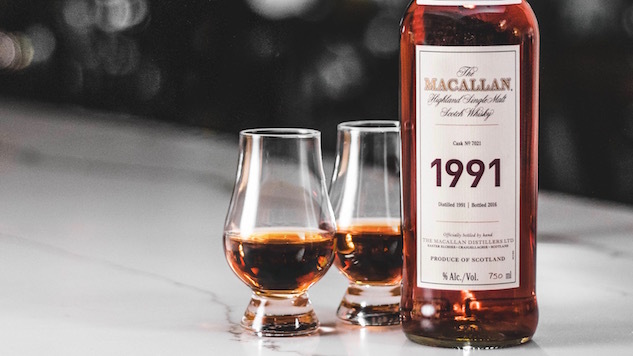 Every year, a new bottle is released, and this brand-new offering consists of whisky that was barreled on March 28th, 1991, and bottled 25 years later at cask strength (49.4 % ABV). Whisky fans who either have a bottle that they’d like to register or would like to inquire about purchasing one of these pricy expressions can email the distillery at fineandrare@themacallan.com.